Hobart is the capital city of Tasmania, which is a great place to visit and the finishing point for the famous Sydney to Hobart Yatch Race. It boasts a friendly and relaxed atmosphere that compliments the exciting nightlife, excellent dining, major tourist activities and lots of different places to explore. Whether you are wanting to stay in the Hobart CBD, waterfront or even the surrounding suburbs of Hobart for a short getaway or a long holiday you will find a wide range of accommodation options available. This includes everything from budget Hobart hotels and backpacker acommodation right through to luxury 5 star hotels and suites. St Ives Motel Hobart - For many years corporate and holiday travellers have been staying at the St Ives Motel and Apartments because of its unique home away from home feeling. Also this Hobart hotels friendly and welcoming staff, combined with an excellent array of facilities will make sure that your stay in the city is hassle free. At Ives provides guests will fully self contained accommodation with queen size beds, spacious rooms and convenient cooking facilities, making it the ideal place from which to base yourself whilst exploring Hobart and Southern Tasmania. Hobart Midcity Hotel - The Hobart Midcity Hotel is a popular place to stay in Hobart because of its wide variety of hotel facilities, excellent location and friendly service. Travellers who choice this budget Hobart hotel will be within easy reach of all the things that the city and Southern Tasmania has to offer. Located in the heart of the city the Hobart Mid City Hotel provides hotel acccomodation complete with complimentary off street car parking, restaurant, room service and much, much more. 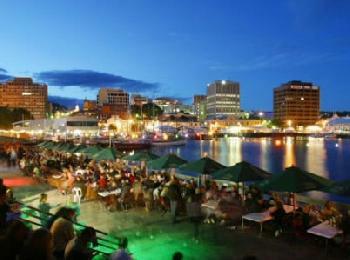 Guests can stroll to the waterfront precinct, visit famous Salamanca Market or check out the views from Mt Wellington. The Old Woolstore Apartment Hotel - Having a great CBD location the The Old Woolstore Apartment Hotel is a popular accommodation in Hobart for travellers of all types. This Hobart hotel features a variety of rooms and self contained accommodation that have been stylishly furnished to suit the needs of both corporate and leisure guests. Located in the heart of Hobart the Old Woolstore provides an excellent place from which to explore all the city attractions of the Hobart CBD as well as touring around southern Tasmania. Fountainside Hotel Hobart - With an enviable position close to everything that the city and the surrounding regions has to offer the Fountainside Hotel is a popular accommodation for travellers on a budget. This Hobart hotel features a variety of rooms that have been stylishly furnished to suit the needs of both corporate and leisure guests. Situated in the heart of Hobart, Fountainside Hotel provides comtemporary luxury hotel accommodation with the Salamanca Market, waterfront restaurants, Cadbury Chocolate Factory and Wrest Point Casino at your fingertips. Riverfront Hotel and Villas - There are many exciting things to see and do in Hobart and by choosing to stay at the Riverfront Hotel and Villas you will be well positioned to take advantge of them all. At this affordable hotel guests will find that the motel rooms are well equipped and that the hotel facilities add a touch of class to the overall experience. The Riverfront Motel has the convenience of being within a 10 minute radius of Hobart's top attractions including the CBD, Battery Point, Salamanca Place, Wrest Point Casino and the Derwent Entertainment Centre. Martin Cash Hotel Hobart - The Martin Cash Hotel is a popular place to stay with budget consicious travellers because of its variety of hotel facilities, excellent location and warm, friendly service. Travellers who choice this budget Hobart hotel will find themselves within easy reach of everything that the city and Southern Tasmania has to offer. This affordable Hobart motel is ideally positioned near the Cadbury Chocolate Factory, Moorilla Estate Winery and excellent shopping districts. Travelodge Hobart Hotel - Travellers will find many interesting things to see and do in and around Hobart, and by staying at the Travelodge Hobart Hotel they will be well positioned to make the most of them. This affordable property has a range of hotel rooms that are spacious and well equipped, as well as hotel facilities that significantly add to the overall experience. The Travelodge Hobart is located in the heart of the Hobart CBD only a 5 minute walk to the heart of the city and Salamanca Market. Many of these hotel rooms have great views of the city and river or Mt Wellington. Waterfront Lodge Hotel - For years business and leisure travellers have been staying at the Waterfront Lodge because of its unique homely environment. Also this Hobart hotels welcoming staff, combined with an excellent range of amenities will ensure that your stay in the city is trouble free. All of the hotel rooms at the Waterfront Lodge include private ensuite bathroom, television, heating, hairdryer, kitchenette facilities and much, much more. Rydges Hobart Hotel - For many years corporate and holiday travellers have been staying at the Rydges Hobart because of its unique service and homely feeling. Also this Hobart hotels friendly and welcoming staff, combined with an excellent array of facilities will make sure that your stay in the city is hassle free. The Rydges Hotel in Hobart provides accommodation in a lush garden setting only minutes from the Hobart CBD and just a short drive from Mt Wellington, the Huon Valley and Constitution Dock. Harringtons 102 Hobart - With lots of fascinating things to see in and around Hobart staying at the Harringtons 102 will place you in a great position to see them all. This affordable property features well equipped and spacious hotel rooms combined with excellent facilities that really add to the overall guest experience. This property is an ideal and inexpensive accommodation from which you can base yourself whilst visiting all of southern Tasmania's attractions. Hotel Collins Hobart - The Hotel Collins is a very popular accommodation in Hobart because of its variety of hotel facilities, excellent location and warm, friendly service. Travellers who choice this budget Hobart hotel will find themselves just a short distance from everything that the city and Southern Tasmania has to offer. The Hotel Collins Hobart provides facilities to suit the discerning corporate or leisure guest including the a cafe bar, free wireless internet access, conference facilities, guest laundry, business centre, luggage storage, daily housekeeping, concierge service, in-house movies, tour desk and room service. Best Western Balmoral Motor Inn - The Best Western Balmoral Motor Inn is a great budget place to stay in Glenorchy, Hobart. It has a wide variety of hotel facilities, excellent location and warm, friendly service. Travellers who choice this cheap Hobart hotel will find themselves within easy reach of everything that the city and Southern Tasmania has to offer. Providing comfortable motel accommodation complete with restaurant and room service the Balmoral Motor Inn is an ideal base to explore not only Hobart but the north and west regions of Tasmania as well. Blue Hills Hotel Hobart - By choosing to stay at the Blue Hills Hotel travellers will find themselves well positioned to take advantage of the many interesting and exciting things to see and do in and around Hobart. At this cheap hotel guests will find that the rooms are well appointed and that the hotel facilities significantly add to the overall guest experience. Patrons at this motel will be able to enjoy the nearby attractions such as Mount Wellington, Wrest Point Casino, Salamanca Markets and the Historic Battery Point. The Waratah Hotel Hobart - Corporate and holiday travellers have been staying at the The Waratah Hotel for years because it has a true home away from home feeling. Also this Hobart hotels welcoming staff, combined with an excellent array of in-room facilities will ensure that your stay in the city is free of hassles. Some of the hotel facilities at the Waratah Hotel include daily housekeeping, tour desk, lounge bar, guest laundry, laundry service, free car parking and the hot cooked breakfast that is included in your rate. Lenna of Hobart - There are lots of wonderful things to do in and around Hobart and by staying at the Lenna of Hobart you will be well placed to enjoy them all. This discount property provides guests with well appointed hotel rooms combined with excellent hotel facilities that significantly add to the overall accommodation experience. The Lenna of Hobart is positioned on Salamanca Place overlooking Hobart's waterfront and the many attractions, markets, craft shops, cafes, restaurants and art galleries in the local area. City View Hotel Hobart - For a long time corporate and holiday travellers have been staying at the City View Hotel because of its homely ambience and warm welcome. Also this Hobart hotels friendly staff, combined with an excellent array of facilities will make sure that your stay in the Tasmania's capital city is hassle free. The City View Hotel is situated five minutes from the Hobart CBD, Salamanca Markets and 15 minutes to the airport. The room configurations at the City View Motel Hobart range from double or twin hotel rooms right through to larger family hotel rooms. Motel 429 Hobart - When visiting Hobart guests who stay at the Motel 429 will be able to choose from a wide range of rooms with discount rates available for longer stays. This hotels central location places it within easy walking distance to many of the city's major attractions, making it ideal for all different types of travellers. Motel 429 is conveniently located opposite Wrest Point Hotel Casino in Sandy Bay and is within minutes of Hobart city centre, University of Tasmania and the picturesque views from Mount Wellington. Brighton Hotel Motel - The Brighton Hotel Hobart is a popular place to stay when visiting Hobart because of its wide range of hotel facilities, excellent location and warm, friendly service. Travellers who choice this discount Hobart hotel will find that they are within easy reach of everything that the city and Southern Tasmania has to offer. Complimenting the well appointed hotel rooms are excellent facilities including a restaurant, bar, bottleshop, gaming and keno lounge, free car parking, guest laundry, daily housekeeping, tour desk and wireless internet access. Mayfair Plaza Motel Hobart - When staying at the Mayfair Plaza Motel in Hobart guests will be able to not only choose from a wide range of rooms but also make the most of the many great facilities. This hotels central location places it within easy walking distance to many of the city's major attractions, making it perfect for both corporate and holiday travellers. These Motel rooms provide confortable and affordable accommodation close to Sandy Bay shopping and restaurant precincts. Mayfair Plaza Motel provides a modern setting that is an easy distance to Wrest Point Casino, Convention Centre, Salamanca Market, Battery Point and the University of Tasmania. Hobart Airport Hotel - There are many interesting and exciting place to visit in the surrounding Hobart region and by choosing to stay at the Hobart Airport Hotel you will be well positioned to see them all. At this affordable property guests will discover spacious hotel rooms, as well as hotel facilities that significantly add to the overall ambeience. For the business traveller there is high speed internet in all hotel rooms, a business centre, photocopying service, faxing facilities and conference facilities. The Hobart Airport Hotel offers quality affordable accommodation right next to the Hobart Airport. Possums Bed and Breakfast Hobart - By choosing to stay at the Possums Bed and Breakfast guests will be able to choose from a wide range of rooms with discount rates available for long term stays. This hotels central location places it within easy walking distance to many of the city's attractions, making it ideal for both corporate and leisure travellers. This Hobart B&B has 3 self contained apartments to choose from the Spa Suite, Bay View Suite and the Honeymoon suite. This affordable property really is a great value for money retreat away from the hustle and bustle of everyday life.